In medium saucepan over medium heat, melt butter. Add marshmallows and stir constantly. When butter and marshmallows are completely melted and smooth, add green food coloring until desired color is achieved. In large bowl, pour marshmallow mixture over Wheaties™ cereal and stir to combine. Drop cereal mixture by heaping spoonfuls into wreath shape on serving platter. Decorate with red M&M's® candies. Tie Fruit by the Foot™ roll into bow. Place at top of wreath. Trim ends of bow to desired length. Cereal treats are the best. Everyone loves them and they are super easy to make! Around the holidays when there’s a lot of hustle and bustle, it’s nice to have a homemade show-stopping dessert that doesn’t take much time and effort, and you probably already have most of the ingredients in your pantry! Traditionally, cereal wreaths are made into small cookies—a time consuming, ooey gooey mess. 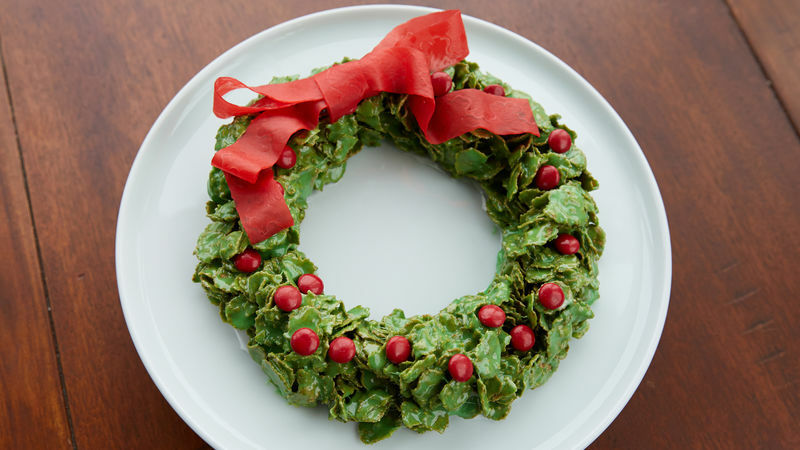 A ginormous cereal wreath is the perfect time-saving alternative, and it looks like a cake! Simply slice off a piece to enjoy. It is so much prettier than just pressing the treats into a pan, don’t you think? Let’s get started on this easy peasy pretty Christmas creation! Grab some butter, mini marshmallows, green food coloring, Wheaties™ cereal and red M&M’S™. On your stovetop, melt the butter in a pan over medium heat. Now add your mini marshmallows. Don’t forget to stir or you’ll end up with a brownish gloppy mess! (I may or may not have experience with this.). When all of the marshmallows are melted, go ahead and stir in some green food coloring. I added quite a bit to get a nice bright green color. Gel food coloring works best. Pour the marshmallowness over the Wheaties™ and stir gently to coat. Plop heaping spoonfuls of the yummy gooeyness onto a large platter to form a wreath. Decorate the top of the wreath with red M&M’s™. Add an amazingly easy Fruit-by-the-Foot™ bow, and it becomes the perfect holiday centerpiece!